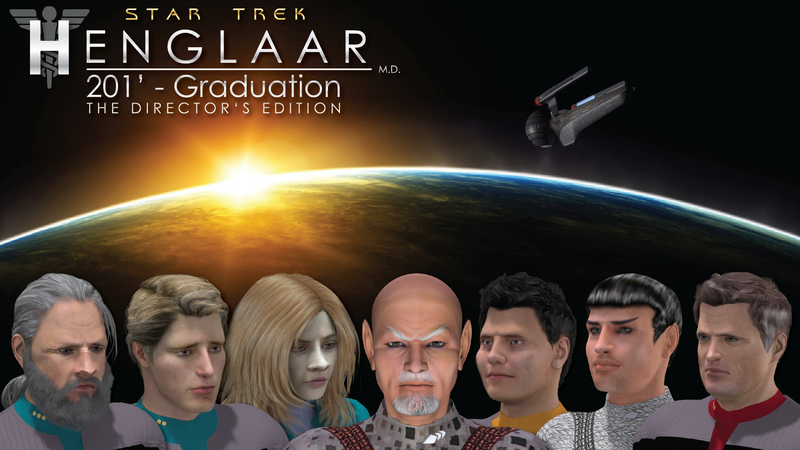 We are pleased to announce that the Director’s Edition of “Graduation”, Star Trek: Henglaar, M.D.‘s second season opener has been released and is available for listening and download. Without backup, Captain Karsten and the crew of the Cole must devise a strategy to rescue Henglaar and his team before they all run out of time. The director’s edition of the episode does more than merge the previously-released two-part version of “Graduation” (HMD 2.01 and HMD 2.02) to tell the complete story. It also features a new series theme and original score written by Wendell Jones. Mr. Jones has composed scores for other Star Trek fan series, including Star Trek: Equinox (audio) and Star Trek: Dark Armada. The series is based on Star Trek, created by Gene Roddenberry and Star Trek: Hidden Frontier, created by Rob Caves. It is inspired by House, M.D., created by David Shore. The next episode of Star Trek: Henglaar, M.D., “Internal Affairs”, is currently in production and is scheduled for a Summer 2015 release. Tagged audio, henglaar, new release.